Have you ever been given a bad gift before? Recently in our small group we were studying love languages. We have a few people in our family who have “gifts” as their primary love language. I am not a gifts person, so it’s been a stretch for me to learn how to demonstrate love. There have been a few times I’ve failed. Like when I left my wife alone on an important birthday. Not good for a gifts love language person. Oops...my bad. Love you hun!! I’m learning. The Holy Spirit is the ultimate gift giver. Matthew 7:11 says, “If you, then, though you are evil, know how to give good gifts to your children, how much more will your Father in heaven give good gifts to those who ask him!” God gives good gifts. According to 1 Corinthians 12:7 these gifts are given for the “common good.” That means that the Holy Spirit works through us in gifts for the benefit of the body of Christ. I’ve made a list of the 1 Corinthians 12:8-11 gifts and a brief explanation. Word of Wisdom - Knowing what to do in a specific situation or how to apply a specific revelation given in God’s word; a promise, command, or other instruction. Word of Knowledge - Know what you should not know. Divine insight into a situation or person. Faith - Faith given to believe God for the supernatural, extraordinary, or miraculous. Gifts of Healing - One of the ways God heals. Often connected to the Gift of Faith. Pray for and see physical healing. “Gifts” cover all illness. Miracles - acts of supernatural power that change or go against the course of nature - calming the seas, withering of fig tree. ○ This also includes the power over the kingdom of Satan - deliverance. Prophecy - This mention is referring to the temporary empowering of the Holy Spirit to give direction, revelation from God. This is about proclaiming God’s will - desires, plans, intentions. See 1 Corinthians 14:3 - strength, encouragement, comfort. Distinguishing between Spirits - To judge or discern prophecies, spiritual expressions, whether a message is from the Holy Spirit or not. Speaking in different kinds of tongues - The Holy Spirit praying through our spirit in direct agreement with God’s purposes. ○ When it’s used in a congregational setting with the intent of conveying a message from God, then it must be interpreted. ○ 1 Corinthians 14:13 - If I have a message in tongues for the congregation, then it’s my responsibility to pray I get an interpretation. However, another Christian may be prompted to share an interpretation. Interpretation of Tongues - Ability to understand and communicate the meaning of a message in tongues. 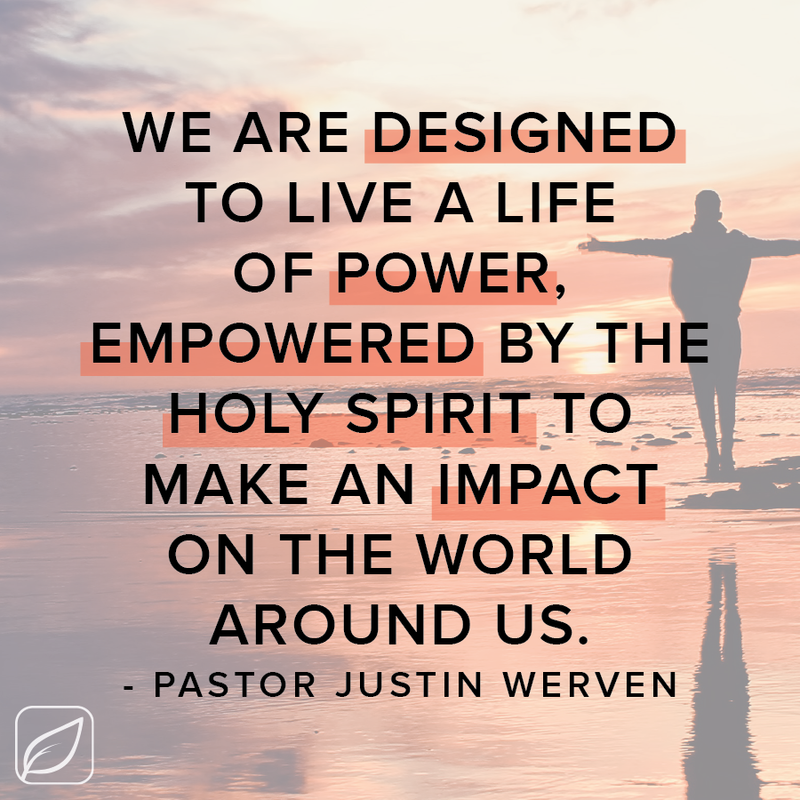 We are designed to live a life of power, empowered by the Holy Spirit to make an impact on the world around us. Paul instructs the Corinthian church to eagerly desire spiritual gifts. Our heart should be to be used by God however He desires, especially in the gifts He gives.